IOS App Developer: WalletIQ, Inc. It started off great, the concept seemed amazing, but way too many issues. In order to keep track of who spent what you have to way weeks in order for your charges to stop showing up as pending or they disappear. I’ve emailed them countless times and they can’t seem to fix this issue. It’s too much of a hassle. Helpful app. 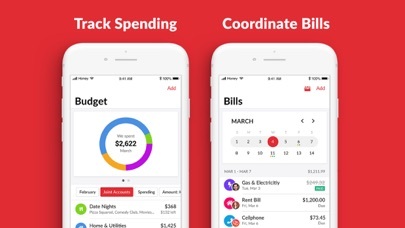 Recommended improvements: carryover leftover budget for each category to the following month; more frequent updates and notifications; a visual of the each category (eg sliding bar showing how much spending left); a way to account for expenses that don’t occur each month (eg taxes, tuition, etc). I love the concept of this app and it has a lot of great features. 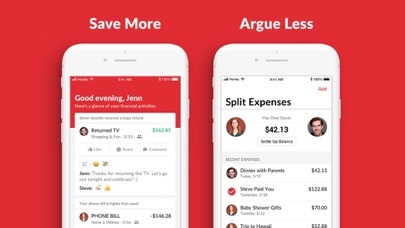 A few things that would make it a lot better: The ability to split finances within the “Bills” section. It would be amazing if the app would automatically split bills in half or by a chosen percentage and assign to each partner. Add due dates and reminders to split bills. Have the split bills be contained within the regular bills. It would be nice to view split bills separately but I’d prefer to have all bills in one place by default. Good but needs a few more features. I like the design of the app and ease of use but need a few features to be able to use this full time. 1) custom categories is essential. I can’t categorize things in these narrow categories. 2) tags. I tag things for tax purposes so I can find them at the end of the year. 3) a website or native iPad app so I can use this on a bigger screen. Will monitor and see if these changes happen to get me to move away from Mint. Almost every time we use the app, it tells my husband and/or me that we need to reauthorize or sync our accounts. It’s super annoying and it makes me question how secure it is that we need to keep entering our bank information in repeatedly. 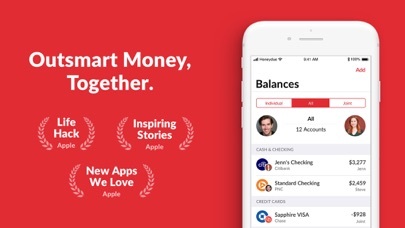 Needs better real time updates with banking account balances etc. So..you couldn’t make it doable on the iPad too? That’s where I’m more likely to use this. I’ll gladly change it after I can use it on the iPad too. It has great potential. Some accounts keep getting disconnected and when I email them they have a problem getting my account info because the app forces me to use the iPhone native email app. I have different emails and it should really let me pick which email I want to use. More IOS Apps by WalletIQ, Inc.